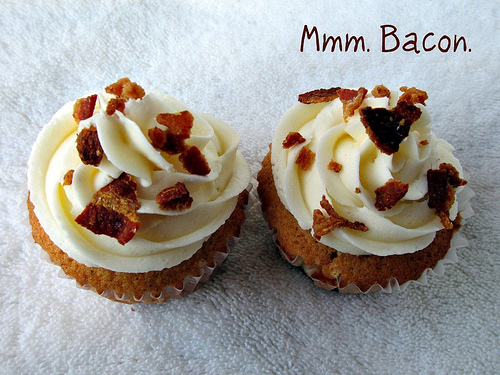 I am a firm believer that everything is better with bacon. 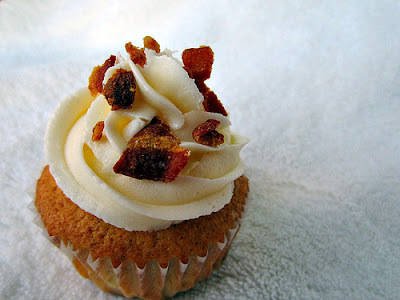 If you're a lover of this porky cured meat like myself then you gotta try this cupcake. Hubs kind of looked at me crazy-like when I said I was making these. I admit, when I first came across the idea I thought it was a little out in left field. But think about it.. Bacon... French Toast... and Maple. All three of those things are usually on a breakfast plate together and seem to be harmonious, so why wouldn't it work on a cupcake? The answer is simple. IT DOES. Treat yourself to this recipe and you're sure to impress people with your creativity and baking skills. 1. Preheat oven to 375 degrees. Line cupcake pan with liners. 2. 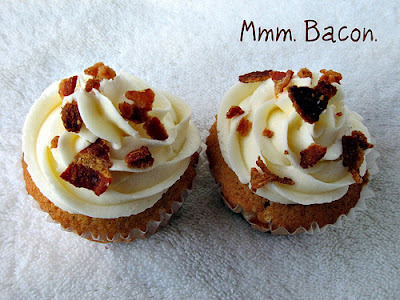 Fry or bake up some bacon slices and cool completely. Crumble strips into small bits for garnish. Set aside. 3. In a standing mixer, cream butter and sugar together until light and fluffy. 4. In another bowl, mix flour, baking powder, salt, nutmeg and cinnamon together. Set aside. 5. Add eggs to the sugar mixture one at a time, waiting until each is fully incorporated. 6. Add half of the flour mix, then the milk and then the other half of the flour mix. 7. Divide batter evenly in tins and bake for 25-27 minutes. Toothpick should come out clean. Mix all ingredients together in a stand mixer with paddle attachment. Beat on high speed until light and fluffy. 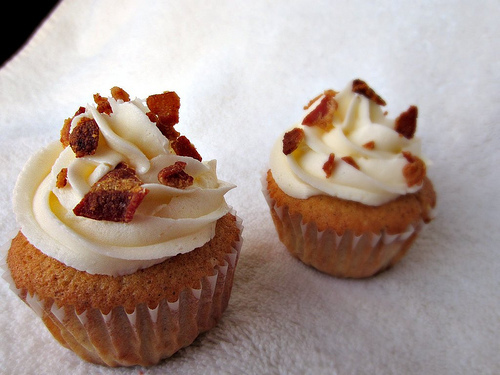 Pipe frosting onto cupcakes and sprinkle bacon bits over frosting generously for a savory garnish.